Who wanted a trip to Wembley anyway? I mean have you seen the price of the burgers there, and you cannot have a beer whilst watching the game. Oh no, a trip to Wembley is soooo not Non League. Give us a decent league campaign any day of the week. That’s what we have been telling ourselves all week since the embarrassment of Chertsey. It has been the elephant in the room for the past week but now it is time to move on. We would all swap a playoff spot, or fingers cross automatic promotion for a potentially embarrassing exit in the FA Cup 1st round to a League side. Anyway there is still the Ryman League Cup to concentrate on isn’t there? So who is up next at the Pan? Well here comes Cray Wanderers. Ask a million people where Cray is and I bet you will get nearly a million blank faces. EvenJames Boyes, the man with the magic trousers, emailed me and asked and he knows everything. Well I have a bit of local knowledge on this one, and you know what they saw about power and knowledge don’t you. Cray are the third oldest football club in the world. Quite an impressive achievement for a team that were formed as a lunchtime kick around activity for the workers building the new railway line between London and the Kent coast. They settled on a pitch alongside the River Cray between Sidcup and Orpington. Today, the suburbia of St Mary’s and St Paul’s Cray are as close to a remnant of the club as you can find. One hundred and fifty years on and they are still going strong, playing at the highest level in their history. Once upon a time the club were closely associated with Woolwich Arsenal when they were in the London League but they didn’t really make a mark on Non League football until 2003 when they won the Kent League and were accepted into the Isthmian set up. Four years later they reached the Ryman Premier League. Since then they have been a surprise to most. 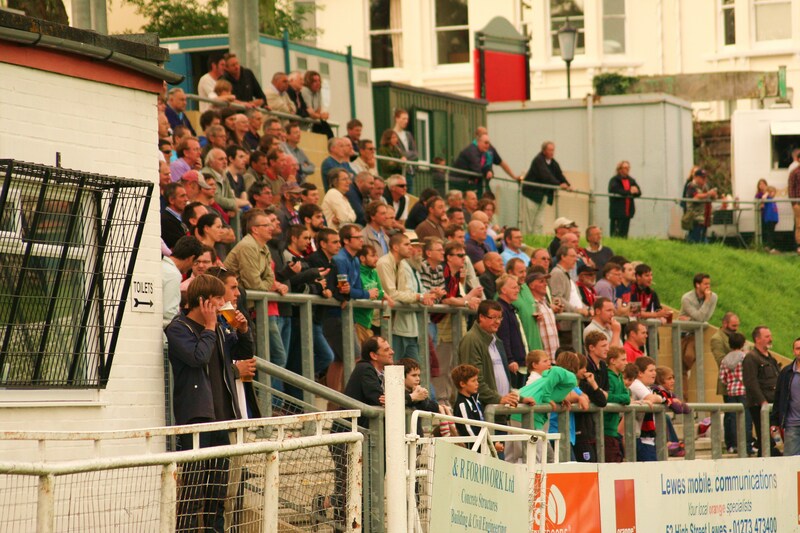 Groundsharing with Bromley, and surviving on crowds of 200, they have been a regular fixture in the top half of the table, and even for a brief period last season topped the table, thanks in part to the prolific form of Laurent Hamici up front. Whilst they still have dreams of a return back to their roots in Orpington, they will probably have to negotiate a further push up the league to justify it. A week is a long time in football, so would the old wounds from Chertsey still be red raw come 5pm or will everything have been forgotten? Well for me it was certainly a long week, thanks to a long week and it was due to be a difficult afternoon keeping my eyes open. A whirlwind trip across the Atlantic to personally shake the hand of Lewes FC members Mr and Mrs Luge Pravda along with a visit to as many Man versus Food destinations as are humanly possible in 48 hours had seen me land at 7am and hot-foot it down to The Pan. Am I mad? I must be. 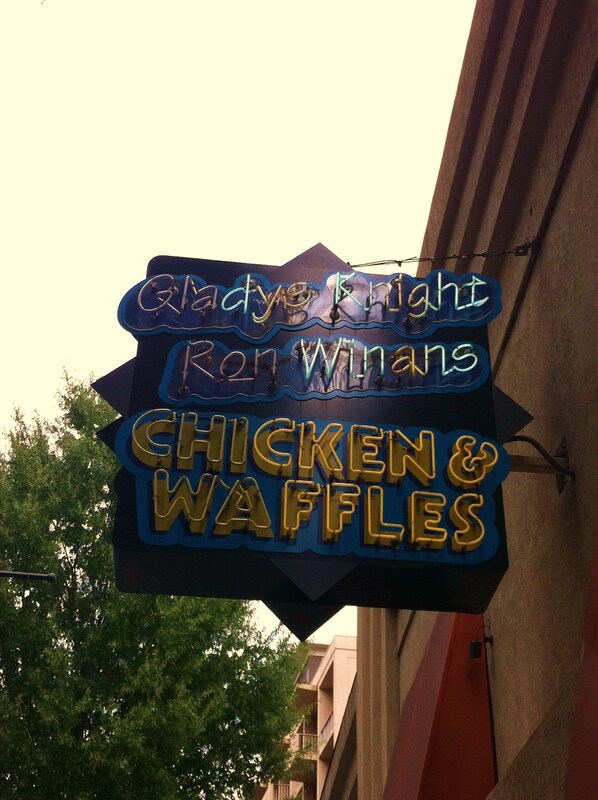 But once the non league bug creeps up on you and sinks its teeth in then you cannot go back and not even a plate of fried chicken and waffles at Gladys Knight and Ron Winans Chicken and Waffle House in downtown Atlanta could not keep me away. I lost count of the number of times I was asked “where are you from” in Georgia. Of course I told different tales depending on the beauty who was talking to me. In the space of one hour I lived in a thatched cottage, a river boat and a castle. I was friends with Hugh Grant, Prince Andrew and Roger Moore. I was the perfect English Gentleman, and not once did I behave in any other way (as Luge will testify under oath). 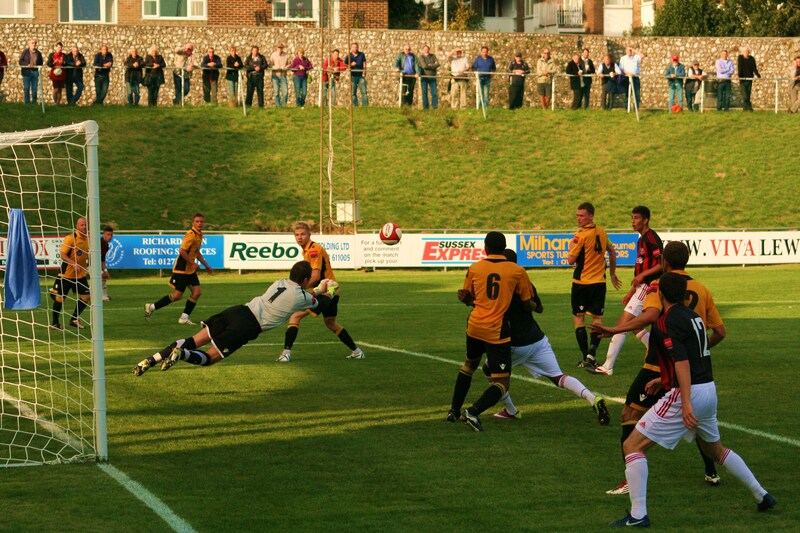 Lewes 1 Cray Wanderers 0 – The Dripping Pan – Saturday 24th September 2011 It is amazing how over the past few years the fortunes of Lewes have mirrored those of West Ham. This season has been the perfect example. Disappointing defeats on the opening day to Lowestoft Town and Cardiff City respectively, highs of putting four past potential play off candidates Aveley and Portsmouth just two weeks ago and then of course the disappointment at an early cup exit to a team from a lower division. Today both teams came into their games in fifth place, and today both won 1-0. Why is that significant? Because I bloomin’ well backed them. Looks like the children will have new shoes for school next week after all. Steve King had been forced into ringing around his contacts in his little black book this week as injuries to key players had left the squad threadbare. In came George Nicholas and Liam Mitchell from Notts County, and they went straight into the team. Also returning was Steve Robinson who had been absent for the past couple of weeks at a wedding (some wedding party that must have been to have missed two games!). The side were rewarded with a crowd of 721, a season best and undoubtedly one of the biggest in this level as well as the Blue Square Bet North or South. Cray Wanderers came into the game as the form team. Top scorers, averaging over 2.5 goals per game and having scored in every outing this season so far they weren’t to be taken lightly. However, try letting that to Christian Nanetti, who with his new Jedward inspired Mohican danced around the defence like David Beckham on Bob Martins. It was no surprise that he was at the centre of the main incident of the game when he tempted Alex Bentley into a rash challenge and the lino signaled penalty. Nanetti got up, picked the ball up and proceeded to place it on the spot. Unfortunately it seemed that there were alternative team orders and Paul Booth took over, sending the keeper the wrong way to give the Rooks the lead. 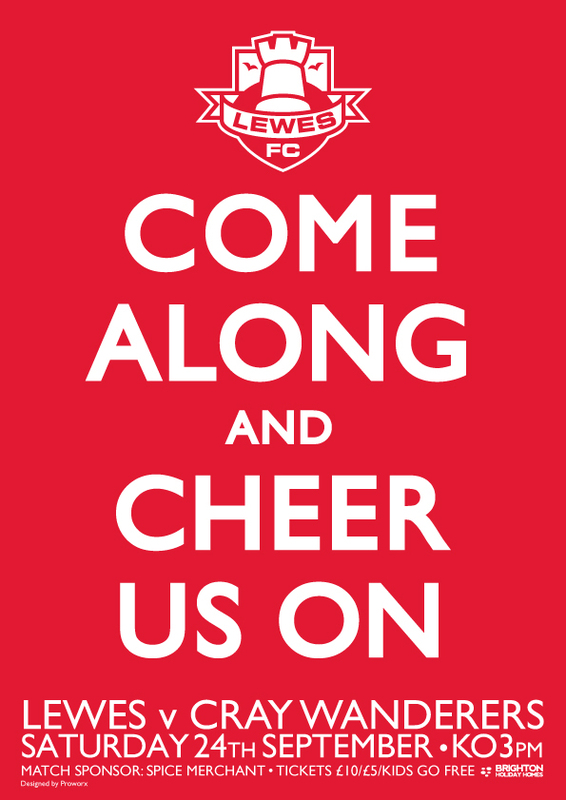 Half time and a chance to catch our breath, or more importantly, top up on the Lewes Blue Label. After a few days of American IPA’s it was good to have something familiar inside. Scores elsewhere were looking good too. West Ham winning (and just by the one goal I needed), Kingstonian beating Hendon and Lincoln Moorland Railways ahead. So it was going to be a nervous last forty five. Or was it? Lewes have a habit this season of having a snooze in the second half, not really creating much and today wasn’t an exception. There was a bit more forward momentum with Malcolm always looking dangerous, but it was still the Cray keeper Walker who was the busier. Indeed apart from one late scare from a set piece where twenty players found themselves in the Lewes penalty area, there wasn’t much to report. The final whistle was greeted with cheers all round as well as a few sighs of relief. The top of the Ryman Premier was now as tight as tight can be, with four teams separated by just one point. Indeed with Lewes playing on Monday evening away at Kingstonian, a win there would take them top of the pile for the first time this season. If you would have asked any Lewes fan at the start of the season whether such as situation was acceptable, they would have bitten your hand off. It had been an interesting week, one of cultural highs in Georgia, and lows in London, but it ended with a pair of wins and a nice little earner from my bet. In the words of Gladys Knight, “Georgia’s on my mind”. More pictures from the afternoon can be found here.